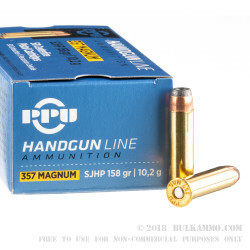 Make sure that the big iron on your hip is worth its weight in gold by keeping it loaded with a potent .357 Magnum ammo choice like these SJHP rounds from Prvi Partizan. Prvi is Serbian company that has a great reputation for manufacturing dependable modern loads as well as for replicating classic loads in hard-to-find calibers. These SJHP, or Semi-Jacketed Hollow Point rounds use 158-grain projectiles with strong copper jackets and exposed lead tips that are punctuated by wide-mouth cavities. The copper jacket covers the rear of the bullet and facilitates cleaner bore over time while the soft nose and hollow tip promote rapid expansion during entry into a target. This mushroom-like expansion allows the bullet to tumble ever so slightly, imparting greater energy to a target's vitals; the terminal energy is quite pronounced thanks to the 158 grain weight which is a heavy option for the .357 caliber. That performance makes this ammo ideal for concealed carry or deer hunting with a long-barreled revolver or lever-action rifle. 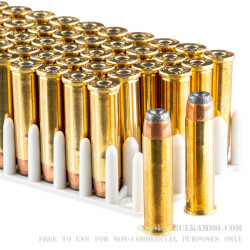 Prvi loads each bullet into a reloadable brass casing that is fitted with a clean-sparking Boxer primer. Nice Ammo with Extra power ! !